It is officially the silly season, the last days of summer, when news traditionally slows down to a trickle and publications fill their pages with stories so fluffy they practically float. My candidate for this year's silly-season birth story is "Koi-Assisted Birth," a winsome website about a couple, "Jane" and "Shane," who are planning a water birth in the fall. 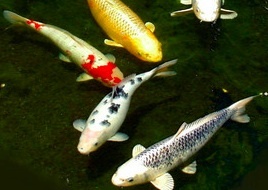 The two have decided to enlist their 15 koi to help them and their midwife usher their new baby into the world. The website has generated some controversy. My guess is that Jane is pulling our leg. She says that "koi are excellent birthing partners," their skills honed by giving birth to thousands, or even tens of thousands, of baby fish, with help from koi dads. "That's exactly the kind of birthing energy I want!" Jane writes. But Shane will have a net at the ready to catch the baby, just in case.